UHS takes entry test in September and announces merit list in Novemeber. All students on margin can't decide whether they should go for other Universities or private medical colleges. It is really hurting when you realize that you haven't got admission this year and it paralysis you badly when you think that you can't get admission into Private sector. At the end let me tell you what happen in the US, they have a well structured system university are bound to follow it. Private sector universities even Harvard Medical School follows it. They rarely change polcies and if they do , give a prior notice prior to it. i think this is v.unfair to students. 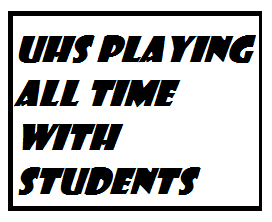 uhs has Hippocratic policies. 1st) the division n percentage of marks is not reasonable n a big question mark on the credibility of BISE. in support of their decision, they give argument that students from far flung areas gain entrance on fsc marks by cheatng n approach. i want to ask, now what about enry test? it is conducted in many cities besides lahore. no one can say that it is 100% merit. secondly, is it fair to decide on 60% entrance marks while kicking aside F.Sc. many students having 980, 1000 marks fails 2 get addmission. i mean this is not done. 2nd)they entertain students from periphery like muzzafargarh, layyah n dg khan not only on open merit but these students have a special quota seats of underdeveloped districts as well. if u see the statistics, 60 percent seats are occupied by them. if u tell me that intelligence has no boundaries then why uhs has given them quota? I'm not against these students, i am against uhs who has provided qouta. if they are too intelligent 2 get admission against most of the seats then they should compete on open merit only. UHS should seriously review its policies otherwise they will lose the intelligent minds. people will bear the outcome of this injustice when thakkar doctors will be prepared from the med colleges. I think Quota is there because there is no GCU in Layah , Muzafargarh , so what they say is that students from those regions have lesser facilities and students from lahore etc will not go there after becoming a doctor that's why UHS has given them Quota so thwy can have some doctors from there that can go back and serve there. While your point about BISE exams is valid, If they are not authentic then why they are taking them ? entry test is an evil 4 students.acadmies r earning lac by this entry test . It is in Lahore Pakistan, and Test is held in September for all medical colleges of Punjab.